Product descriptions are an often neglected yet powerful opening act in the consumer decision-making process. Above the fold, you’ve got your product title, images and your product description. Yet despite product descriptions being a crucial third wheel on this tricycle, it’s rare to find a brand that uses the wee little copy opportunity to be personal, engaging, fun and persuasive. Product descriptions that don’t seem to stop, much like that speech at a wedding where you think they are done, then they take a sip of their wine, then a deep breathe, and…launch into round two. Product descriptions that are too brief . You don’t need to sell the entire product in this little paragraph, but you do need to ensure you communicate your key selling points AND get people excited enough so they continue scrolling instead of slapping the back button. What Are Product Descriptions? And Do They Deserve Your Attention? A product description is the on-page copy of your product listing. It breaks down the features and benefits of your product and compels a prospect to buy from you. Most companies make them official-sounding, feature-heavy and don’t consider the user. However, a smart company like Chubbies know that product page is also a place to sprinkle their brand personality. 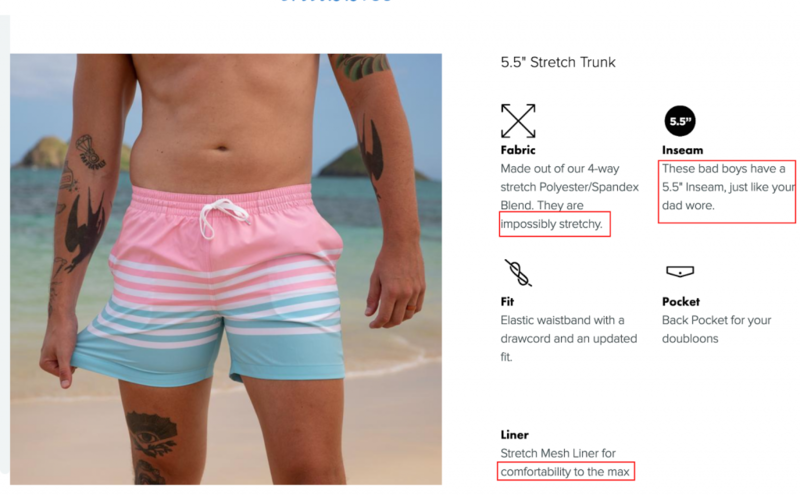 Here’s the engaging product copy of their 5.5″ Stretch Trunk. I have marked their use of conversational and warm language that makes it relatable to their audience. Well, NNGroup conducted an Ecommerce User Experience research asking users to complete a purchase. They found that 20% of the overall task failures are attributable to incomplete/unclear product information. If a shopper’s question remains unanswered, then they abandon the site and search Google for alternatives. So if your store pulls $1M in annual revenue, then optimizing your product descriptions could mean an extra (and juicy) $200,000 annually. As marketers and people of commerce love focusing on shiny objects like Facebook ads, yet spending a Sunday afternoon with a cup of tea to write some descriptions could turn out to be a $200k afternoon. 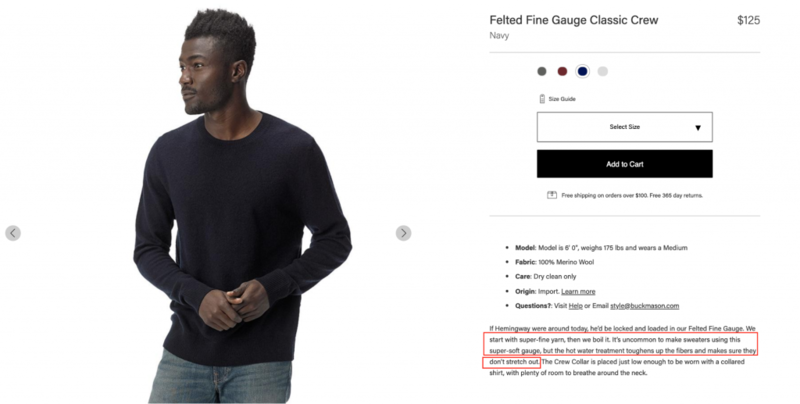 How Long Should Your Product Descriptions Need To Be? There aren’t any best practice around length. But you can aim for around 300 words for snagging SEO benefits for a basic product, highlighting its benefits and features. However, depending on the complexity of your product and its current awareness among your target audience that number can vary drastically. Also, remember to present the essential information about your product above the fold (use an inverted pyramid structure). And use short sentences, short paragraphs, and short words to give a delightful reading experience to your prospects. 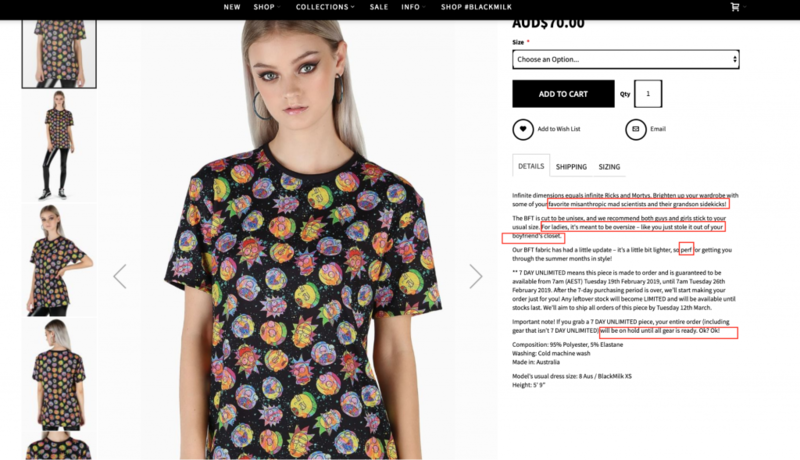 How Do You Write A Compelling Product Description? Here are five quick tips for writing compelling on-page product copy that sells your product to persuade a prospective buyer. On the internet, you can afford to be a little loose with grammar. Indeed, engaging your customers requires a rather casual and conversational tone of voice while breaking a few rules. Go out, talk to your customers, and find out the kinds of phrases they like to use. You might take help from your buyer persona already. If you don’t have one already, then, perform user research. And find your audience demographics, likes, preferences, problems, hopes, and the like. For product copy, the most important aspect is making them relatable by using the style that your prospective customers like. Find out the slangs and the frequent phrases used by your audience. When writing your product copy, assume that you’re having a conversation with your customer and they are your friend. Sprinkle some personality in your copy while presenting the “awesomeness” of your product. It makes them more authentic and takes away the salesy vibe that people generally associate with such descriptions. It’s okay to use colloquialism and technically inept terms (like dude, wacko, dang, dufus, and the like) in your copy. For instance, in the Rick and Morty BFT by BlackMilk, look at how they have fun in the details of the product. They use informal terms like “perf” and crack jokes like “For Ladies, it’s meant to be oversize – like you just stole it out of your boyfriend’s closet.” It works for their audience and makes the buying experience entertaining. Does that bring ideas on how you can leverage your brand personality on your product pages? Search traffic is critical for the success of an Ecommerce business because it’s free, repeatable, and converts well. Find keywords you can target for your products and use them in your page copy, title, meta description, alt image text, and the URL. Also, we have already talked about the length of your product description. Ensure that you have a top-notch loading speed with great user experience on mobile. Try to have unique text on all your product pages to avoid content duplication. If you’re using manufacturer’s product information (likely used by other stores on the web), then ensure that you use a noindex meta tag for such product pages. For example, when I plug in “moto full zip”, American Giant results occupy the top SERP positions. 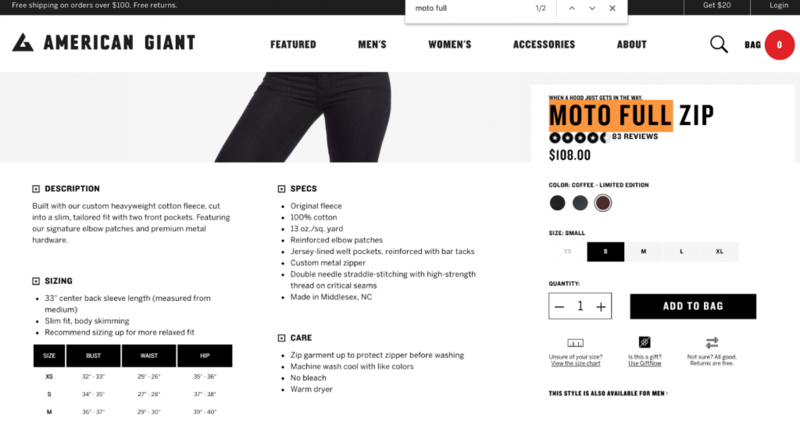 The search blurb does a great job of highlighting the unique benefits along with the features of the brand’s women’s moto zip jacket. American Giant isn’t worried using the EXACT keyword “ample number of times” in their product copy either. See, SEO is all about helping the user now. Sure, you can hire product description writers from Fiverr at $5. And they will turn around a feature-heavy, salesly, and impersonal write-up. However, that won’t inform your customer and serve their intent of making a buying decision. Look at the product description of a T-Shirt below. It is bland and focused on the features. The unique aspect of the product that it highlights is you’re showing your support for a nonprofit by buying it. Would you feel like buying even if you have altruistic motivations? Overall, don’t go overboard in your usage of keywords on the page to please bots. Use natural language and state how your features will impact the lives of your customers positively. 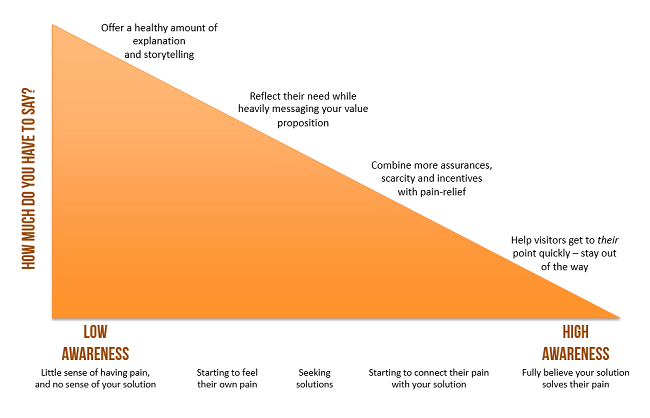 If the description gives a clear picture of how it will “feel” like after using your product and does so authentically, then a prospect will spend more time on your product page. The positive engagement signals will hence reflect in your search engine rankings. Makes sense? Also, for finding the right keyword for your product pages, you can use a tool like Ahrefs. It makes sense to find long-tail keywords with clearer intent that convert well. They are also easier to rank and make more sense to target for a new brand. 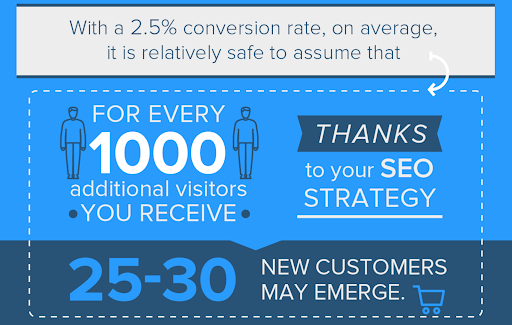 As an Ecommerce brand, preferably create a keyword strategy focused on revenue, not traffic. Remember I showed you a short story “Focus on Quality” by the David Kind founder. It instills confidence and quickly grabs the attention of a consumer. Because humans are suckers for stories. Have you got any interesting tidbits of how you go about manufacturing your product? If you have taken special care in crafting your product, then you can state that in your description to add character to an otherwise purely commercial listing. Buck Manson shares one such interesting piece of information on their Felted Fine Gauge sweater page below. They also state how their process of “hot water treatment” ensures they “don’t stretch out” highlighting a clear benefit for their prospect. In a study of 90,000 food and health product descriptions from the Japanese e-commerce marketplace Rakuten, it was found that certain words can predict sales. Specifically, products that invoke culture or authority help in selling. You can begin by using the 401+ power words compiled by Sumo. Remember how people pick out individual words and sentences on a web page, simply scanning text online? It calls for using bullets, numbers, images, and other elements that improve the readability of your page. On their product page, Allbirds depict the benefits of their Wool Runners (shoes) through concise copy with self-explanatory custom icons. The icons enhance the user experience and make the page incredibly easy to scan. Often for products at lower price points, it makes sense to use succinct copy sans any story and not addressing any objections. You merely need to “show” how your product appears through pictures. 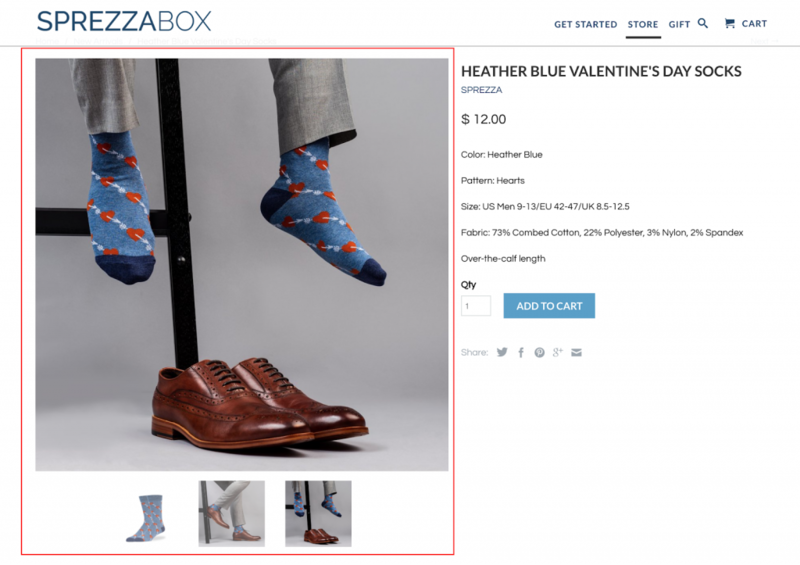 In the socks product page below, Sprezzabox box use three high-quality images. It depicts socks on the ankle of a model to help the customer visualize how it will look on them. The zooming-in feature on the product visuals alongside the bulleted copy is sufficient for a prospective customer to choose if they want to buy the socks. Product Description Are Critical To Selling MORE! When done right, product descriptions help an on-the-fence prospect to press the buy button. They are an asset as it’s the only time when a customer seriously expects being sold to and proactively evaluates how your product fits into their lives. 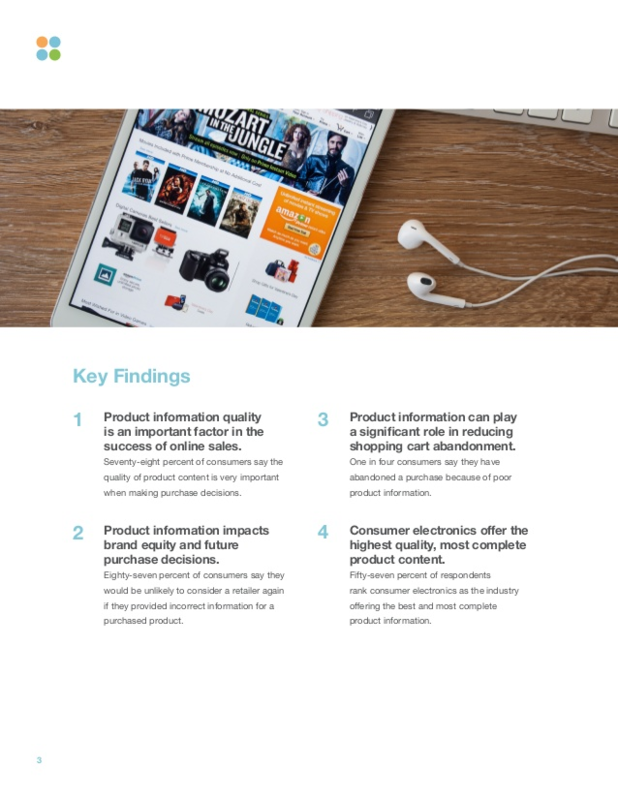 Indeed, the Product Information Report (surveying 1,542 customers) by Shotfarm found that poor product content heavily impacts the returns, shopping cart abandonment, and brand trust. I have shown you examples, tips, and answered the basic questions to write compelling product descriptions. Now, it’s your turn to make it happen! Have you ever optimized the product descriptions for your store? And have you got any additional tips on writing compelling ones? Let me know in the comments below.